“THE Spice Girls are in then…” quips Suggs in response to a little over ambitious harmonising from the ladies on the front row as he brings the show to a close with a celebratory version of Our House that’s laced with as much pathos as geniality. It’s the perfect ending to a turn that’s cut as well as his razor-sharp three-button suit. A mass of wondrous contradictions – a one-man show apart from ace pianist Deano from the band The Rifles, that’s frequently funny and often hilarious, but also deals with loneliness, guilt, the price of fame and the singer’s bust ups with the bottle – What a King Cnut opens by reminding us that the much misunderstood monarch’s moment with the sea was intended to demonstrate how empty and worthless is the power of kings. 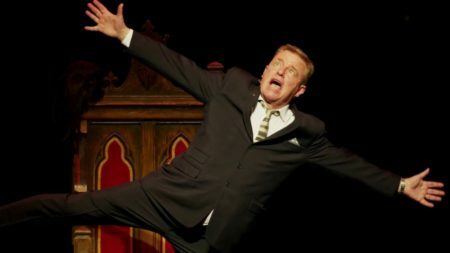 What follows is a charming, joyful rattle through Suggs’ life as a pop star, in the realm of Madness. You get the feeling he’s never fully at ease with fame, yet it’s pretty clear that but for stardom he would have been a right tearaway – consequently the tension in those hit Madness ditties of yore rings ever more clearly in these pared back renditions. Suggs is an engaging raconteur, a natural showman and whether declaiming the balancing influence of his family, recalling his horror (as well as the Spice Girls vocal warm up) at forgetting the words at the closing ceremony of the 2012 Olympics, or recounting his drunken efforts to liven up a Primal Scream set at Glastonbury, he obviously knows his way around a yarn. It helps that What A King Cnut is so well structured with stories that overlap, throw forwards and back on a rock steady narrative arc. There’s also an increasingly riotous running gag about Brian May. Proper stuff, Cnutty Boy; proper.